Line from the film: "You were scared, weren't you?" It was December of 1983 when Michael Jackson’s Thriller, the first ever “extended” music video, premiered on MTV, and like millions of people across the country, I made sure I tuned in to see it. At the time, I was a mild fan of Jackson’s Thriller LP, which was on its way to becoming one of the best-selling albums in history, but what really piqued my interest about this particular video was its director. Aside from helming two of the era’s funniest comedies (Animal House and The Blues Brothers), John Landis had also wowed audiences with An American Werewolf in London, which featured the groundbreaking special effects of Rick Baker. With the award-winning make-up artist on-hand once again for this short film / music video, I figured Michael Jackson’s Thriller was going to be something pretty special. The scene then cuts to a movie theater, where Michael and his date (Ray again) are sitting in the audience, watching the sequence we just saw. As it turns out, the whole werewolf encounter was part of a horror movie, and Jackson’s date, frightened by what she saw on the big screen, rushes out of the theater, with Jackson following close behind. It’s while the two are walking home that Thriller kicks in, with Jackson belting out the lyrics as they make their way down a darkened street. A number of zombies, in various stages of decay, are slowly moving towards them. Terrified, the girlfriend’s eyes dart all around, staring at the monsters that now surround her, only to discover that Jackson himself has suddenly become one of the walking dead! There’s a lot to like about Michael Jackson’s Thriller, not the least of which is the song itself. With lyrics like “You try to scream, but terror takes the sound before You make it”, Thriller was the perfect tune for a horror-themed video, and the dance number towards the end, featuring Jackson and his zombie back-ups, is choreographed perfectly. Then, of course, there’s Vincent Price, who gets in on the fun with a creepy bit of dialogue squeezed into the middle of the song (“Darkness falls across the land”, Price says, in his most sinister voice, “The midnight hour is close at hand…”). And as they did in An American Werewolf in London, Landis and Baker do a tremendous job with Thriller’s make-up and special effects, giving us both a werewolf transformation (not quite on the level of American Werewolf, but impressive all the same) and some nasty, gooey zombies, a few of which are pretty damn gross. All of these elements are squeezed into a 13-minute short film that, according to the Guinness Book of World Records, was the most successful music video of all-time, selling some nine million copies. 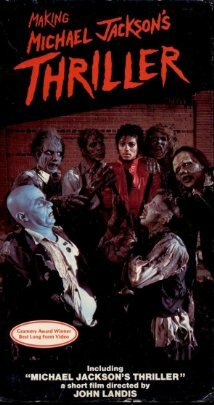 And with Jackson, Landis, Baker, and Vincent Price giving it their all, I’m surprised Michael Jackson’s Thriller didn’t sell more than that. Not sure this qualifies as a movie, but is magnificent just the same. I was also one if those who watched the premier and loved every second of it. Wendell: Thanks for the comment! With my challenge, I'm opening myself up to absolutely everything, and this was so groundbreaking that I felt I had to include it. And it looks like we had the same experience with it (which is cool).